Hertswood Academy in Borehamwood is a true testament to the power of hard work and a positive vision. Having pulled out every stop to improve their academic record over the past few years, they are now nearing the end of an ambitious building project that will give them a physical campus that matches their impressive academic standing. The £32m project, taken on by Willmott Dixon Construction, began in 2017 and is due to be completed later this year. 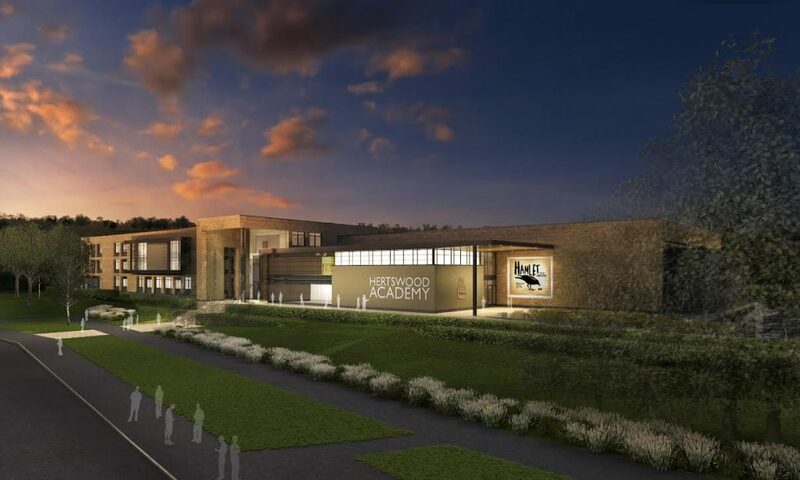 The cutting edge facility will accommodate 1400 pupils (including 200 sixth formers), and offer state of the art technology, with flexible learning spaces, a theatre, a sports centre and more. Designed around an attractive quadrangle, with plenty of inviting outdoor spaces, the new campus will be a positive boon to the local community and provide the very best in contemporary educational facilities in an environment that promotes both scholastic and social development. For us here at Tinder, this has been an exciting and rewarding opportunity to get involved with a project that will help shape the next generation and introduce them to the wonders of digital technology. We’re providing ultra-fast fibre cabling to supply gigabit internet for the entire campus, which will allow them to house the very latest technology in every classroom, from super-fast internet connections to interactive whiteboards. Our staff really love projects like this as we’ve watched the site take shape over the last couple of years and will be able to see the positive results of the initiative when the new campus opens in September. We can’t wait to see the finished result and we hope that the students are as impressed as we are!